Little Common Football Club produced a performance that Ken Cherry would have been proud of as it sprung a cup surprise last night (Tuesday). The Commoners won 5-1 against higher grade Arundel in their first home match since the sudden passing of their chairman and founder 12 days earlier. On an emotionally charged night at the Rec, goals from Jamie Crone (2), Lewis Hole, Russell Eldridge and Martin Denny put Common through to the quarter-finals of the Parafix Sussex Senior Challenge Cup. In sub-zero temperatures, the teams observed a minute’s silence prior to kick-off, during which a floral tribute was placed alongside the matchball on the centre spot. The flowers were then placed alongside a club shirt and scarf at the place beside the western goal where Ken used to stand during home matches. Once the football got under way, Macron Store Southern Combination League Division One side Common - whose players wore black armbands - took a giant step towards the last eight with three goals in the first 19 minutes against Premier Division opposition. Crone opened the scoring in the 11th minute after Lewis Hole got on the end of a ball over the top and squared for his strike partner. Crone celebrated by lifting his shirt to reveal a t-shirt bearing a picture of Ken and the words ‘you will always be with us’. Crone doubled his and Common’s advantage four minutes later, calmly slotting into the bottom corner for his 23rd goal of the season having been put through by a lovely Eldridge pass. Things got even better for Common soon afterwards as a good low cross from the right by Jared Lusted was met by a neat first time finish from Hole for his 19th of the campaign. Arundel pulled one back in the 21st minute. Common were unable to clear Liam Da Costa’s cross from the away right and Asa Nicholson picked out the top corner. It remained 3-1 at half time, but Common effectively put the tie to bed with their fourth goal within five minutes of the resumption. Lusted went down under the challenge of Spencer Adams and Eldridge sent goalkeeper James Fernandes the wrong way with the resulting penalty. It was the first time Common have scored a spot-kick at the western end of the ground this season and captain-for-the-night Eldridge - Ken’s grandson - celebrated at the spot where his grandad used to stand. Josh Biggs hit the base of the post for Arundel and home goalkeeper Matt Cruttwell saved bravely at the feet of Nicholson before Common rounded-off the scoring and just about the perfect night in the 68th minute. Lusted teed up Denny to score with an emphatic first time finish only three minutes after coming off the bench. 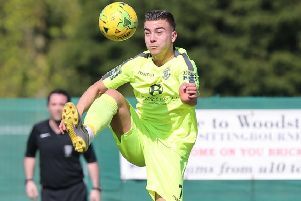 Common’s reward for reaching a cup quarter-final for the third time this season is a trip to Ryman League Division One South high-flyers Worthing. Common: Cruttwell, Sherwood, S. Mote, Eldridge (Curteis 83), Morris, Ammoun, Lusted, Brown, Hole, Crone (Denny 65), Estherby (Wells 74). Subs not used: Trickett, Spice.